This is a sweet story about the love that a mama polar bear has for her cub. Each page has a little bit of text that rhymes with the page after (or before) about how this mama bear loves her cub…forever. 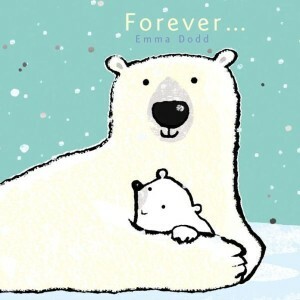 The illustrations are cute with the little one looking like a sweet cub ready for a cuddle. And a few pages have shiny foil-like bits that enhance the illustrations. Little ones will be please to see the shiny bits show up on the pages (as either the moon, water, snow drifts or the like). Basically, this is one of those calming stories that would be perfect to read to kids before they sleep and dream of the “forever” love of polar bears. Have the child take a nap (great calming story before sleepy-time). Color a picture with metallic-colored crayons. Write a letter or draw a picture to tell someone just how much you love them. February 17, 2014 in animals, book review, picture books, preschool.